I think I may be a cyberbully. At least that’s what the Media Literacy Council (MLC) has led me to believe. Last Thursday, MLC posted on Facebook a series of illustrations for parents under the heading “Signs your child is a cyberbully”. The first sign is “He/she quickly switches screens or closes programs when you walk by”. Oh, no. That’s what I do whenever my wife walks by while I’m watching a Blackpink video. The second sign is “Laughs excessively while using the computer”. Oh, no. That’s what I do sometimes during a Blackpink video. The third sign is “Get unusually upset if he/she cannot use the computer”. Oh, no. That’s what happens to me when my wife bans me from using the computer because I watch too many Blackpink videos. But the council’s Facebook post was criticised for being “simplistic” and “disconnected from internet culture”. A little history. The MLC was formed in 2012 by the Government to “actively develop public education programmes that will help the public navigate media, especially the Internet, safely and responsibly”. But last week, instead of MLC educating the public about the Internet, it seemed the public was educating the MLC. That wasn’t well received either. But more importantly, what I want to know is – am I a cyberbully or not? Confession: The MLC post is not the only reason I think I may be a cyberbully. Anyone remember Mr Cuthbert Syn? Probably not. Three years ago, he became famous (or infamous) after a picture of him in a Reserved seat on the train went viral. Vilified online, Mr Syn was also mocked for his weight and receding hairline. So I wrote an article in The New Paper that said it was wrong to fat-shame and bald-shame the man. Last year, I was taken aback to see an e-mail in my inbox with the subject line: “Letter of Demand - To remove article on website”. It was from Mr Syn. “I would want the article to be removed immediately. As this has caused me a lot of distress since 2015, especially when I am unwell due to a heart disease. Under the Protection of Harassment Act (POHA), your article is an offence. In the first place, it had been two years since he went viral. No one is interested in reading about him any more. He was old news. Second, my article was actually kinda defending him. And this was the thanks I got? Third, even though my article can no longer be found online, other articles about him abound on the web, including The Straits Times report I mentioned earlier. Last and not least, why bring up the Protection from (not “of”) Harassment Act? The 2014 law was designed to make cyberbullying a criminal offence. Was I cyberbullying Mr Syn? Or was he the one cyberbullying me by threatening legal action? I wish my wife would let me use the computer so that I can Google for more information and definitely not watch any more Blackpink videos. Fortunately, I still have my iPhone. Jisoo is so pretty, even on the smaller screen. It's not just KFC and Burger King. With effect from 17 October 2018, the drink stalls at the canteens, food courts and selected F&B outlets/restaurants will no longer be giving out plastic straws. This will be replaced with paper straws on demand. 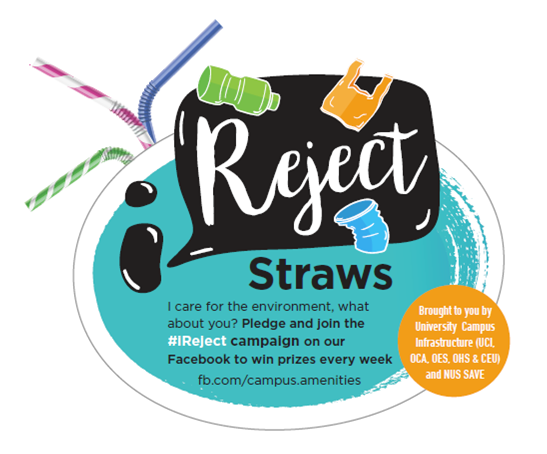 We encourage you to go straw-free or bring your own reusable straws to help us care for the environment. Paper straws will still be made available on demand if there is a need. One thousand camels' back broken? CSC stands for Civil Service Club. 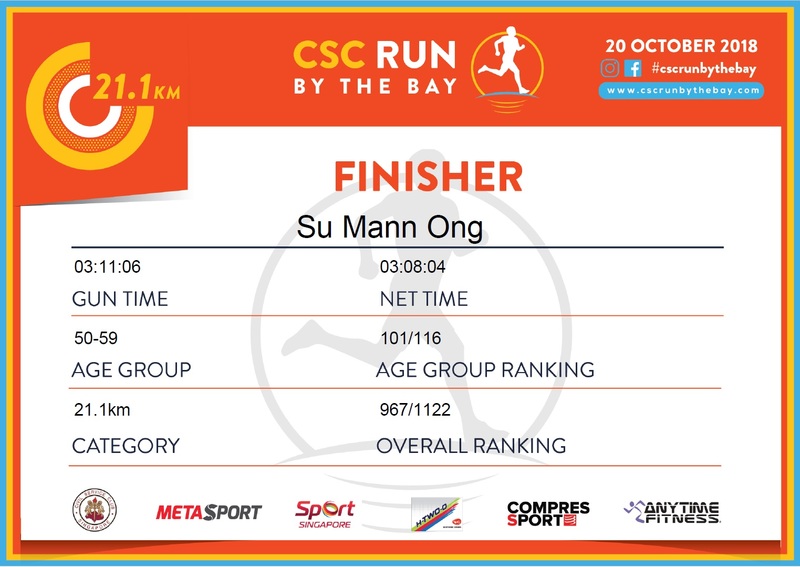 Flag-off for the half marathon category in CSC Run By The Bay on Saturday was 5.15pm. Yes, it was sunny and a bit hot for a race. I grabbed my first cup of H-Two-O after the 7km mark, which meant I had pretty much given up. I just wasn't feeling it. I went to pee twice for the first time in a race. Also, I saw an otter for the first time, near the Otters Crossing sign no less. I was surprised by how big the animal was. It was like a seal with legs. This was one of those races where I swore I would never sign up for another half marathon again. 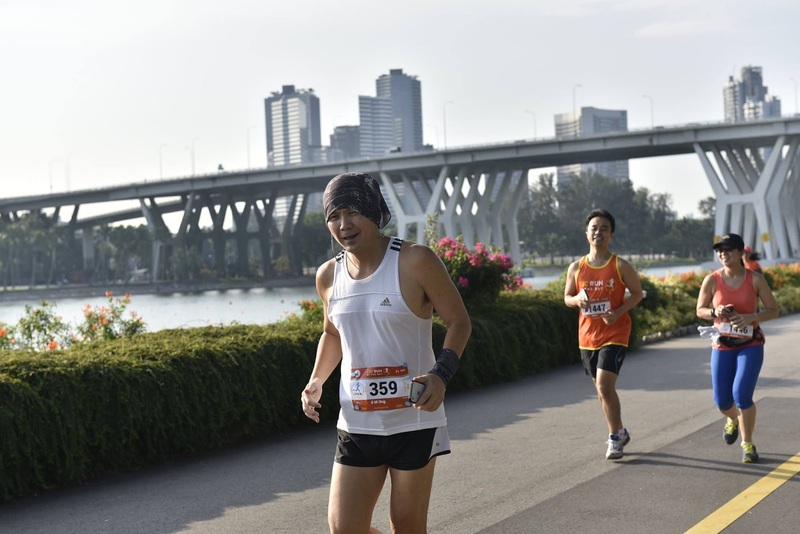 It was my second worse 21km performance ever. 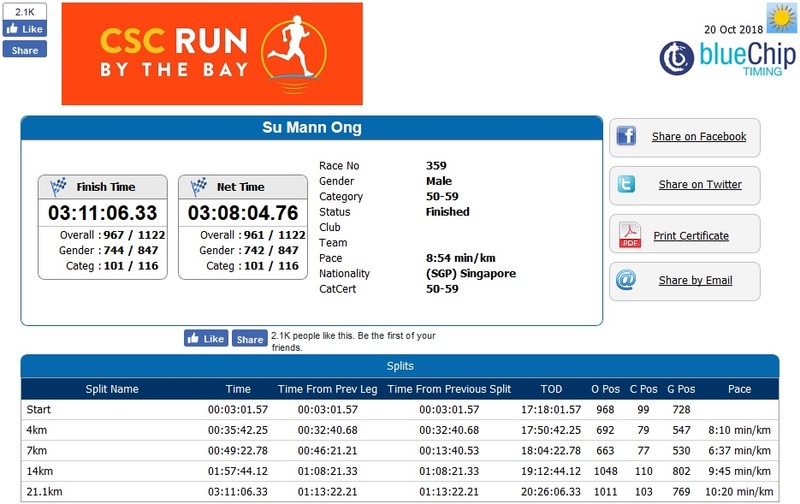 Whatever form I had for the Army and Bintan half marathons is gone. Maybe it was the heat. Maybe it was the lack of sleep. Maybe it was the shoes. Maybe it's just my overall lack of fitness. This was the second time I joined an evening half marathon and both times, I did miserably. So maybe I just don’t do well in night races. At least I saw an otter. Apparently, a metal bench at a bus stop in Braddell Road is worth $1,500. I mean, that’s even more than the cash prize the Miss Bikini Universe Singapore winner gets, which is only $1,000. The pageant organiser could just give her two thirds of a bus stop bench. 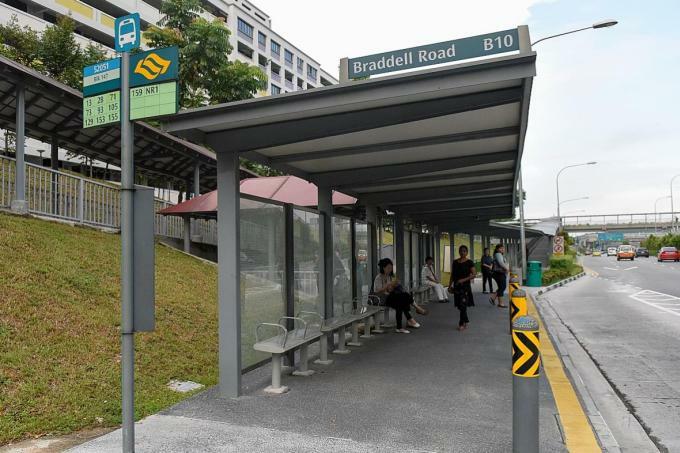 How do I know a metal bench at a bus stop in Braddell Road is worth $1,500? Because The Straits Times reported last week that such a bench was stolen by Tan Ke Wei, who was sentenced to a seven-day short detention order for committing mischief and thereby causing damage or loss amounting to $500 and above. ST said the incident occurred in June last year near midnight when Tan was waiting for a bus. Apparently, the bus took so long to arrive that Tan started “meddling” with the bolts that secured the bench and he managed to unscrew all eight with his fingers. He then wrapped the dismantled bench in a garbage bag and took a taxi home. My question is, did he just conveniently happen to have a garbage bag with him? Some people carry an umbrella in case it rains. I guess this fella carries a garbage bag in case he needs to wrap a bench he removed from a bus stop. And did Tan take a taxi because he missed the last bus of the night, since it was already around midnight when he started unscrewing the bench? The midnight surcharge must have cost him an arm and a leg, though probably not as much as the bench. But why did he take the bench in the first place? Tan reportedly “intended to renovate his new flat with a bus stop design concept”. Wait. Did I miss an issue of Home & Decor? Is public transport-themed interior design the latest thing along with plogging and flossing (the Fortnite dance, not cleaning between your teeth)? Who doesn’t want to be reminded that they are too poor to afford a car even when they are at home? Call me Mr Fashionable then. Actually, I wouldn’t mind renovating my flat with an MRT platform design concept if I can get one of those giant ceiling fans. You’ll need an ez-link card to enter my flat. But the biggest question of all is, how can a bus stop bench cost $1,500? And I thought the new iPhones were overpriced. With that kind of money, the hawkers at Jurong West Hawker Centre could pay for 7,500 returned trays at 20 cents each. It didn’t help that after the ST report came out, both Ikea and Courts posted ads on Facebook promoting benches costing noticeably less than $1,500. As if to rub it in Tan’s face, Ikea touted its $159 Industriell bench as “No dismantling required” and Courts said its $179 Callum dining bench “comes with no detention”. Kick a fella when he’s down, why dontcha? I think those ads are a form of cyber-bullying. But judging by the pictures of their benches in those ads, I find the Ikea and Courts offerings don’t quite capture the special essence of a place where I would wait for a bus and contemplate the meaning of my car-lite existence, if any. So as enticing as the lack of dismantling and detention may be, it seems that if I really want to authentically recreate the grim ambience of a bus stop in my home, only a $1,500 bench will do. Perhaps I can win the Miss Bikini Universe Singapore contest one and a half times. With regards to your article, I think the bigger concern we should be looking at is why are the taxpayers paying 1500 dollars for a bus bench? Who is the company selling it? I’m sure if you do some proper digging, it will be all about ‘commission’ and lining certain people’s pocket. Flag-off at a little past 7.30am for Chua Chu Kang Big Farm Run (8km) this morning. I jogged from home to the starting line, which added 3km to my distance.. It rained, which made the weather nice and cool for running. I don't mind getting wet because I get wet from sweat anyway. I didn't know SPCA is in the area.